A very dull blip on Jezebel to what I thought would potentially be an interesting story. An interesting and inspiring story told in a somewhat dull way. Fine. All good. I had never heard of the website before so I flipped over to the homepage. It looked promising, cute so I scrolled down only to find a post by Mallory Ortberg who I remembered liking when she wrote for Gawker. Double promising she wrote a post about Go Ask Alice, the book that scared me away from ever sharing food or drinks with another human being. Fun little post but even better was a link within her post. I haven't read them all yet but I'm pretty sure that I've believed most of them for my entire life. 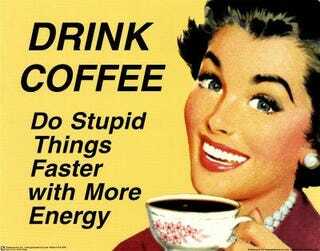 Is there an antidote to caffeine?